Across the 2 reserves there are a wide range of terrestrial habitats types varying from bare rock through to mature woodland. Due to a lack of systematic management in the past the site has developed into the present attractive 'semi-wild' state that can be seen today. Below the canopy, the sparce understorey/shrub layer contains mainly Broom, Hawthorn, Holly, Wild Cherry and Rowan with smaller amounts of Hazel and Elder - many of which appear to have re-generated naturally, despite the high levels of disturbance. There are also numerous mature Hawthorn throughout the woodland, many of which are remnants of the plantation's original boundary hedge. The eastern edge of the site forms part of the boundary between the City and County of Nottingham and remnants of an double hedgerow are still visible on each side of the Sandy Lane bridleway: these may be some of the oldest trees on the site. Along the hedge bottom are Ramson, Hedge Woundwort and Garlic Mustard, amongst others. Moving self-set seedlings from near the bases of larger trees to more favourable sites. Pruning small trees to promote strong, straight growth. Weeding seedlings to reduce competition from fast growing vegetation (grasses). Removal of damaged/unsafe branches from the older Oaks. Creation of habitat stacks using the the removed branches. Introduction of selected trees to increase species diversity. We also work with Broxtowe Borough Council in reducing the height of the trees near the summit of the site and restored the view over west Nottingham. 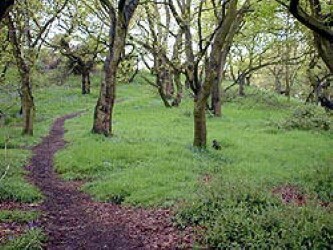 Other species found in this area are Elder, Gorse, Hawthorn, Bramble and Pedunculate Oak (some of which are remnants of the original plantation). The dense trees and shrubs allow very little light through to the lower layers resulting in sparse vegetation at ground level, especially in the areas dominated by Broom and Gorse. However, beneath the Hawthorn thickets, species such as Common Chickweed, Lesser Celandine, Foxglove and Bluebell can be found along with numerous grass species that are found elsewhere on the site. Due to the free draining nature of the soils, the site often becomes very dry, especially in late summer. This causes some of the vegetation to become tinder-dry, especially the grasses, Broom and Gorse. As such there are several small fires a year - some deliberately lit. 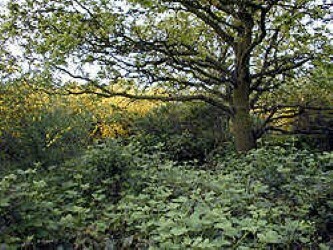 Management of the scrub is intentionally minimal, as we are trying to maintain the area as a 'sanctuary' for wildlife. The main focus of our attention is to limit access, especially during the breeding season. This is achieved by using vegetation (such as Bramble), cut from elsewhere on the site as part of our management projects, to block the many feint desire lines leading into the scrub. The only real regular active vegetaion management undertaken is the removal of burnt dead shrubs. Ideally they are left in-situ to limit disturbance and access whilst the surrounding vegetation regrows, and then removed in the following year. We have also created a few 'experimental clearings' deep within the scrub in order to see what species will regenerate once the dominant broom has been removed. The information gained from this will be used to plan any future management, if any is felt necessary. 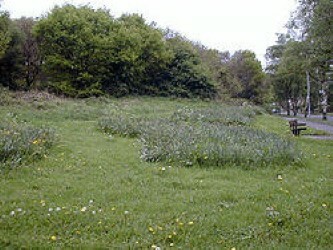 Across both reserves are small areas of rough grassland and mixed scrub. The main species present in the scrub are occasional Broom, dense Bramble and Raspberry and a small thicket of introduced Ornamental Cherry (cultivars). There is also a sizeable dense stands of Bracken scattered throughout. 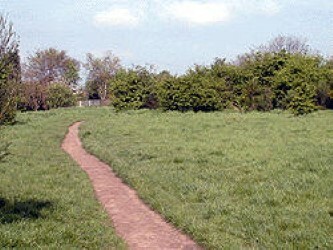 The rest of this area is grassland with a dense rank sward, with the dominant grasses being Perennial Ryegrass and Cocksfoot. Other floral species present in the field layer are Cow parsley, Hogweed, White Dead Nettle, Spear and Creeping Thistle and Curled Dock. 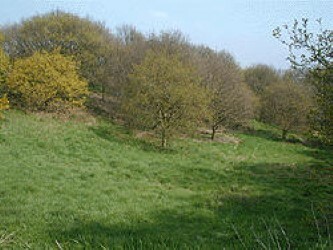 Control of scrub encroachment, restricting any shrubs and trees to their present extent. Removal of washed-down sand and encroaching vegetation from footpaths, and resurfacing where necessary. Introduction of a mowing regime and removal of cut vegetation in order to reduce nutrient levels and dense thatch layer. At the top of the site are a couple of large area of semi-improved grassland, which was once part of Bankfield Farm. These sizeable areas of grassland have a dense sward, comprised of Cocksfoot, Common bent, Perennial Ryegrass, Hairy Brome, False Oat-grass, Wavy Hair-grass among many others. There are also numerous species of herbs in the field layer including Cow parsley, Meadow Buttercup, Ribwort Plantain, Greater Plantain, Common Ragwort, Perforate St John's-wort Hawkweed and Red, White and Bladder Campion, along with many others. Around the perimeter, adjoining the housing, there are numerous large overgrown hummocks of accumulated garden rubbish, dumped by residents rubbish over the years. This, along with the high levels of dog faeces, has enabled dense stands of Nettle and Rosebay Willowherb to dominate in a small number of areas. Management of these areas of grassland has been predominantly through the implementation of a mowing regime. Working in close partnership with Broxtowe Borough Council, the area is mown once a year, in early-mid September, and all cuttings are then removed from the site. Some small areas are deliberately left uncut to provide cover and over-wintering sites for many of the invertebrates present in the grassland. This will slowly reduce nutrient levels available to the vegetation and hopefully allow more characteristic sandstone species to thrive. Also, raking up the cut material removes some of the deep thatch layer that has built up over the years of neglect, allowing more seeds to reach the soil level, and hopefully germinate. Other management tasks involve control of invasive species, such as Rosebay Willowherb and Nettle - once the plants have flowered, they are cut down/pulled up to prevent them from setting seed. 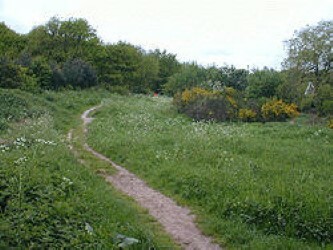 A sizeable section on the Sandy Lane Open Space LNR has been restored to more typical grassland. To allow easier access across the Alexandrina Plantation, the rough path has been widened surface through external funding to create a circular wheelchair friendly route across this section of grassland. These are areas of open grassland areas where lack of management in the past has enabled a dense stand of Bracken to become dominant. Over the years a thick layer of partially decomposed fern 'mulch' has accumulated that serves to prevent other seeds reaching the soil layer to germinate, and so other herb species are few and far between. From late spring through to late autumn the dense shading from the Bracken severely restricts competition from other herb species that are already present. However, in early spring numerous Bluebells are able to flower and seed before the first 'fiddleheads' unfurl and the dense canopy closes over, shading out most other vegetation. Despite the lack of light and space, several tall grass species are able to compete with the Bracken, with Yorkshire Fog, Cocksfoot, Tufted Hair-grass and False Oat-grass being common. Management in this area was initially been aimed at reduction and control of the Bracken stand. This involved bashing/cutting the stems twice a year - in June and August. To date we have reduced both the height and density of the stand, which has presented the grasses and herbs with more opportunity to compete. Experiments wereundertaken within this compartment to ascertain the best way to deal with the thick mulch layer in future projects, once the Bracken has been brought under control. This section is a small area of improved amenity grassland, lying adjacent to Thoresby Road, with Perennial Ryegrass dominating the sward. In springtime, large amounts of planted Daffodils form a colourful display. This area is mown several times a year by Broxtowe Borough Council, as part of their road verge management policy, and so few other species of herbs are able to become fully established. Those found throughout the year include low-growing species such as daisy, Creeping Buttercup, Dandelion, Ribwort Plantain and White Clover. Management As this area is mown several times a year by Broxtowe Council direct management by the Friends is minimal. Although bare rock in itself may not be thought of as a habitat, it is important in that it allows specialist species to colonise the rockface, small pockets within the rock and the shallow soils surrounding the outcrop. This is especially true on the north facing slopes which are shaded by trees, where lack of direct sunlight makes the rock slightly cooler and damper. Lichens are able to grow on the bare rockface and grasses, mosses and herbs (such as Herb Robert and Common Cat's-ear) colonise the small pockets and ledges where sand and soil has accumulated. Slightly further back from the outcrop, where there are very shallow soils is a dense carpet of moss with Sheep's Sorrel and Heath Bedstraw. 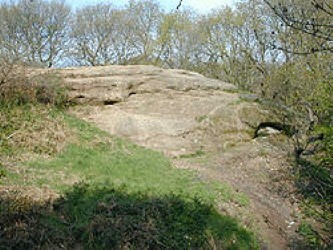 Management of these outcrops is minimal and normally involves removal of graffiti and accumulated litter, as the outcrops are a popular meeting point with local teenagers. Broxtowe Council installed two benches at the summit outcrop, so that visitors can rest whilst savouring the extensive view over western Nottingham. Other management indirectly concerned with the outcrops is the periodic management of the surrounding trees to ensure that the views are maintained. For a full listing of all plants recorded on the site to-date. Use the links above to go to the desired section. This page lists all the Herb species identified on the site to-date. Hopefully this list will grow over time as other species are discovered or begin to colonise. Each species is categorised with both its common and scientific name, along with a 'frequency' based on the standard D.A.F.O.R rating. This gives a guide to the incidence of each species throughout the site as either being Dominant, Abundant, Frequent, Occasional or Rare. Please note that these ratings are only relevant to the site, and a species denoted as rare in this list is not necessarily a rarity. If the Common Name is GREEN, this signifies that there is a photograph of that species in our library: click the link to view the relevant photo and click anywhere image to close it. This page lists all the Tree and Shrub species identified on the site to-date. Hopefully this list will grow over time as other species are discovered or begin to colonise. This page lists all the Grass and Fern species identified on the site to-date. Hopefully this list will grow over time as other species are discovered or begin to colonise.